This Strawberry Blueberry Mini Cheesecake Trifle recipe is surprisingly simple… and simply delicious! One of my favorite things about summer is the availability of delicious, fresh fruit! 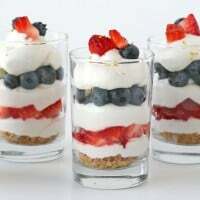 Fruit is such a beautiful accent to many desserts, and in the case of these red, white and blue trifles, fruit is the perfect way to add color! To compliment these fresh summer berries, I whipped up a fluffy, no-bake cheesecake (from my Cherries on a Cloud recipe). 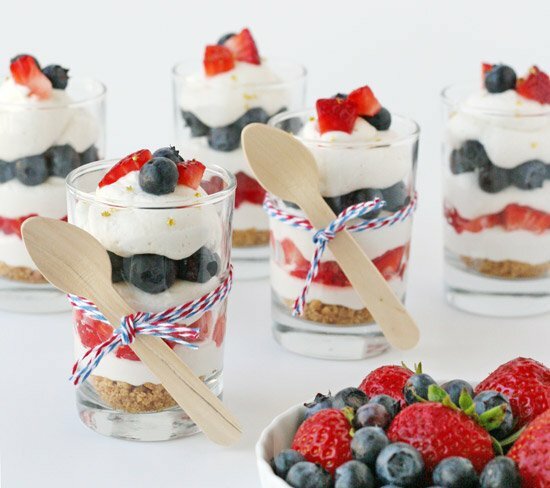 The result is a red, white and blue treat that comes together in under 30 minutes and is just so perfectly cute! This fluffy, no-bake cheesecake dessert is simple to prepare, and is delicious accompanied by fresh berries. Crush crackers in a large ziplock type bag. Pour crumbs, sugar and melted butter into a bowl and stir until fully combined. Pour into a 9″x13″ casserole dish and press into a even layer. Bake at 350*F for 10-12 minutes, until light brown. Allow to cool. 1. Beat cream cheese in the bowl of an electric mixer until smooth. Add powdered sugar, beat to combine. Add lemon juice and beat until fully incorporated. Add milk, and combine. 2. Fold cool whip or feshly whipped cream into cream cheese mixture. 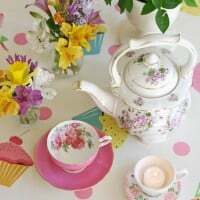 Spoon into dessert dishes, or for smaller dishes, fill a large piping bag and pipe into dessert dishes. 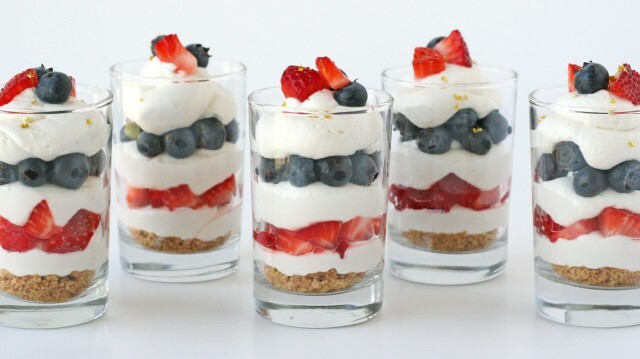 To create the dessert as shown, layer a spoonful of graham cracker crumble, then a layer of cheesecake, fresh chopped strawberries, more cheesecake, fresh blueberries, and a final layer of cheesecake. Note- Using the proportions listed above, you will likely end up with extra graham cracker crumble. Store the remaning crumble in an airtight container up to a month. The desserts shown are in 5 oz juice glasses (from my local grocery store). In place of Cool Whip I used an all natural version I discovered at Whole Foods Market, Truwhip, and was very happy with it! Fresh, organic berries provided by Whole Foods Market. Mini wooden spoons from Garnish. The bakers twine is from The Twinery. 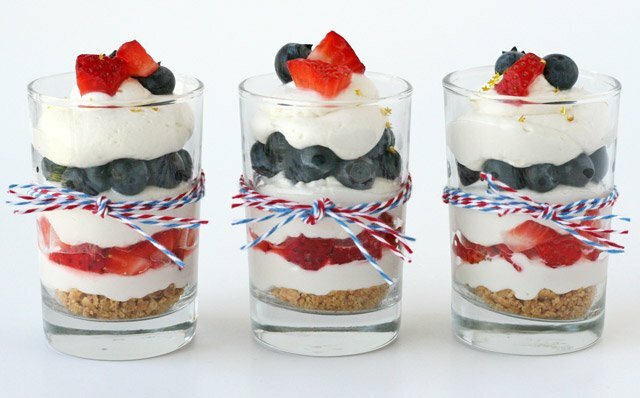 Looking for more red, white and blue treats? Use my newly organized Recipe Index and view all of my 4th of July Recipes and Ideas. Fall Treats…and off to San Francisco! This is such a cute idea. I can already see myself creating this for the next potluck I’m invited to, and bowling over everyone. I absolutely love these!! Perfect for July 4th! Love how bright and beautiful these are!!! Not only colourful, but looks so YUMMY too! these are almost too pretty to eat! i absolutely love the idea – too cute!! 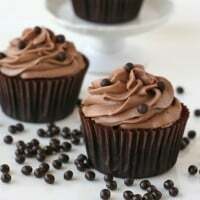 yum, those look so cute and yummy and I love the new look of your blog! So simple. Life is simple and sometimes can be delicious. Great photos. Thanks for share. LOVE your new design, so pretty! these min cheesecakes are adorable, love the graham crackers, yum! I love your new look, great choice! What a cute idea, I just love the twine and little wooden spoons. So easy! I love these! Can you assemble them the night before? We ate ours the same day they were made, but I’m sure you could make them ahead of time… the fruit my “leak” a bit, but they will still be delicious! Another option would be to prepare each element ahead of time, and assemble them the day they will be eaten. Hi! 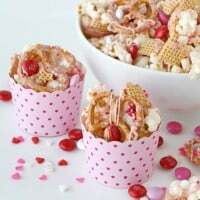 These trifles are beautiful and I’m thinking of whipping up a batch for this upcoming Valentines, but I was wondering if it’s possible to substitute the cream cheese for mascarpone? And what does 1-8 oz mean? I’m not from the States so I’m not too familiar with the U.S. units. Does it mean 8 oz (1 cup/236mls)? Hi Suzu, 1- 8oz. is for ONE, 8 ounce package of cream cheese. Cream cheese in the U.S. is sold in 8 ounce blocks. I have never tried this recipe with mascarpone, but I think it could work well. I haven’t used mascarpone a lot, but if I remember correctly, it is more rich, and less tangy that cream cheese. I might suggest using 1/2 cup mascarpone and a tablespoon or two of sour cream. For this reipe, the measurements do not have to be super exacting, so I think it would work well with some experimenting. Sure, feel free to experiement! Sounds delicious! I made these this weekend for an impromptu dinner party and they were no doubt the star of the evening! Everyone was quite literally trying to lick the last remnants in their glasses. Trader Joe’s sells the equivalent of TruWhip called “House Whip”. Last I checked, it was $1.99 and had the exact same ingredients and nutritional facts as “TruWhip”. Just an FYI for those not close to Whole Foods like me! Hi Mary Ellen, Great to hear! I have seen that product at Trader Joe’s, and I LOVE all things Trader Joe’s, but I hadn’t tried it yet. I have made this recipe with real whipped cream as well and so that’s a good option. I was wondering how far in advance you think it is safe to make these? The night before? I prefer to serve them the same day they are assembled, but you can prepare all of the components ahead of time (at least a day in advance) and then assemble the day of serving. Would it be possible to make this in a trifle dish? Would I have to double the recipe?